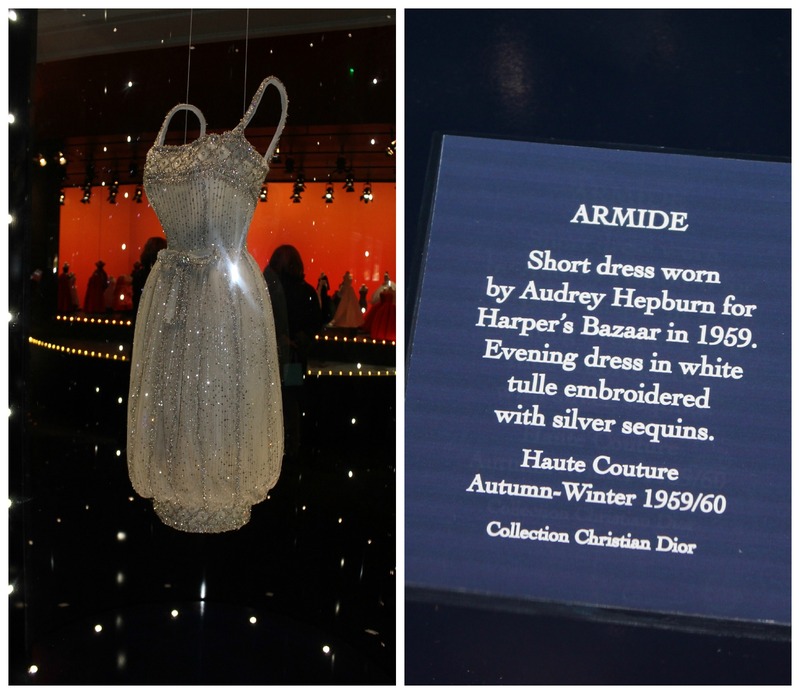 I had the most fabulous time visiting the ‘So Dior’ at Harrods Exhibition. Harking back to my twenties, if I could have picked an era to live, I would have chosen the very early 50’s, and I would have moved heaven and earth to have been dressed in Dior. 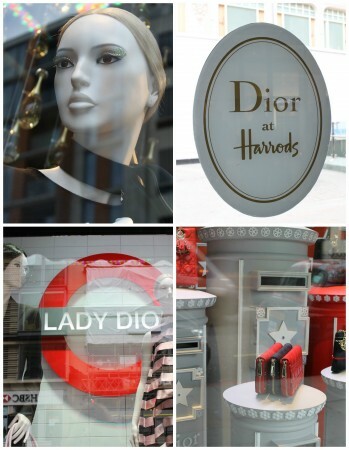 But back to 2013 – Harrods had allowed a takeover of the most gracious kind with a tribute to the French fashion house and its theme of ‘French Savior Faire and British charm’. Harrods and Dior were celebrating a 60 year relationship. After 18 months of planning and a week of installing we were invited into the world of Dior. When I visited Harrods, it was an absolutely freezing day – I can’t ever remember an April day in London that was so cold. So cold that you wanted to rush inside and head straight to the café for a warming hot chocolate. But no, to have missed the store windows on this occasion would have been sacrilege. 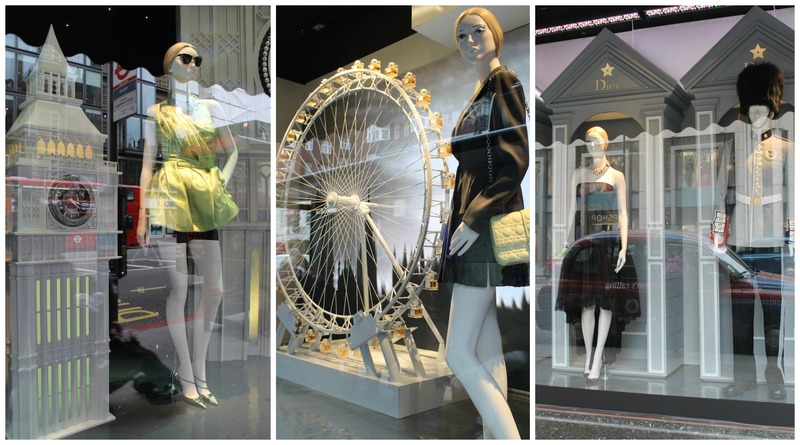 The windows invited you to walk down the Brompton Road to view the Iconic London landmarks combined with the beauty of Dior’s products and fashion including the first ready to wear collection designed by Raf Simons for Dior. And then it was time to head up to the fourth floor and the start of the wonderful ‘Dior experience’. I was greeted by lots of handsome men saying ‘Take as many pictures as you like’, (they did mean of the exhibition!) which is a far cry from the usual ‘Photography Forbidden’ signs at most exhibitions these days. 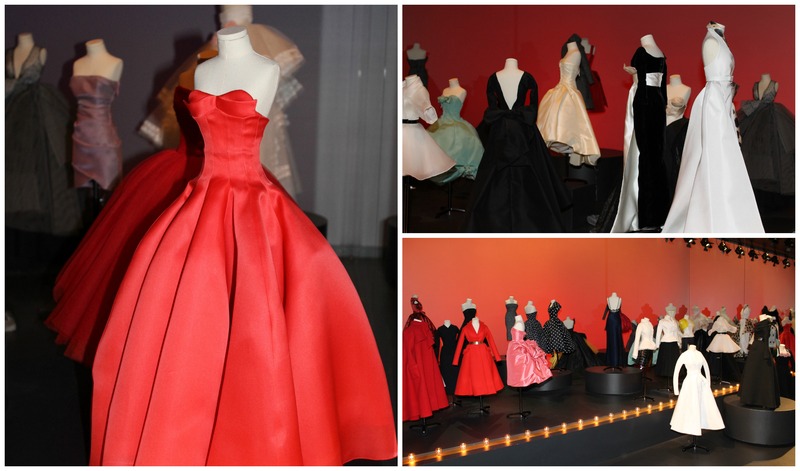 So it was a treat to be able to wonder around taking shots of the dresses, displays and some never-before-seen items. Dior once said “The tones of grey, pale turquoise and pink will prevail” and it is this well known grey which greeted me at the entrance, with the reconstruction of the façade of 30 Avenue Montaigne, the famous Paris headquarters, where in February 1947 Dior debuted his first collection. The legendary French fashion designer caused a worldwide sensation reintroducing flowing ankle-length, voluminous skirts - fashion had come to a standstill during the war, many women were in uniform and materials were tightly rationed. 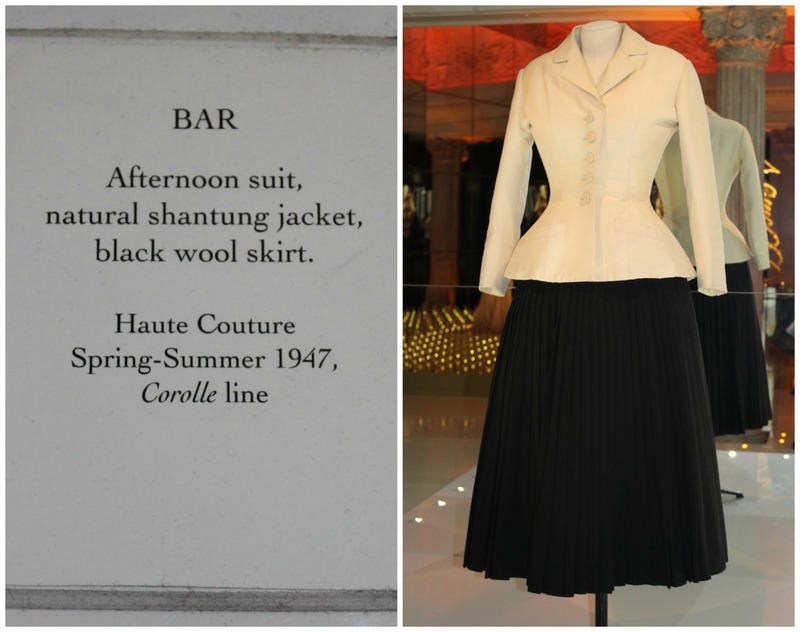 In February 1947 Dior presented his first collection which he named ‘Corolle’ (to flare out) and Huit but they were quickly christened the “New Look” by the American Press. Much talked about was his extravagant use of voluminous material after such wartime restrictions. 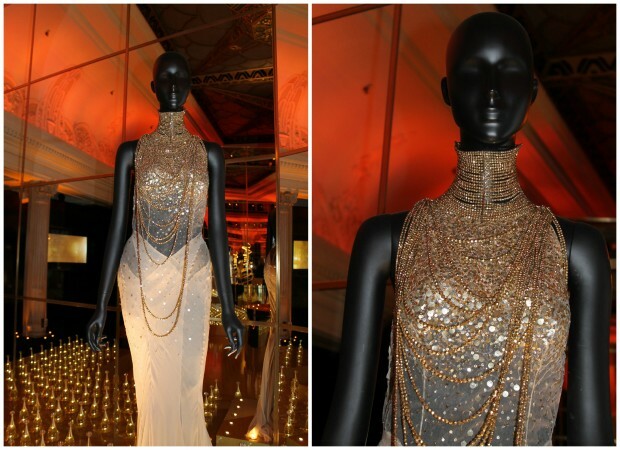 The New Look ‘talk of the town’ was the dress named ‘Cherie’ using 80 metres of white silk faille – wow! Evidently he owed much to Mme Raymonde, head of the studio, who always managed to find just the right material, when most post war cloth was of a really poor quality and any gorgeous fabrics very scarce. 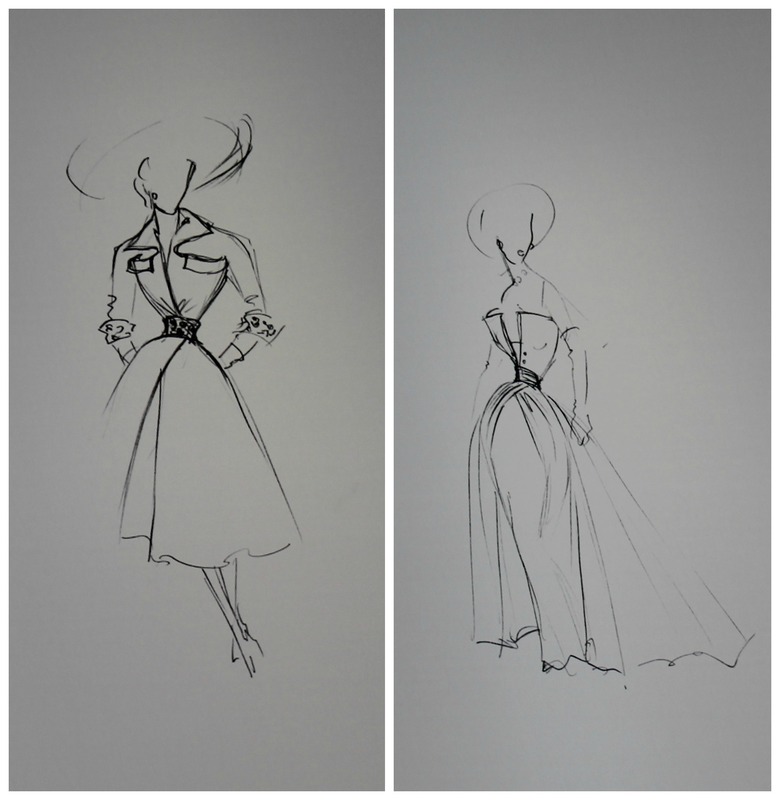 Dior’s collection re-established Paris as the centre of world fashion. To set off his dresses to their best advantage and not compete with any colours, Dior chose his favourite style in decoration, 18th-century interiors, and traditional features – Trianon grey, Fontanges bow and Louis XVI medallion have always been part of the world of Dior. 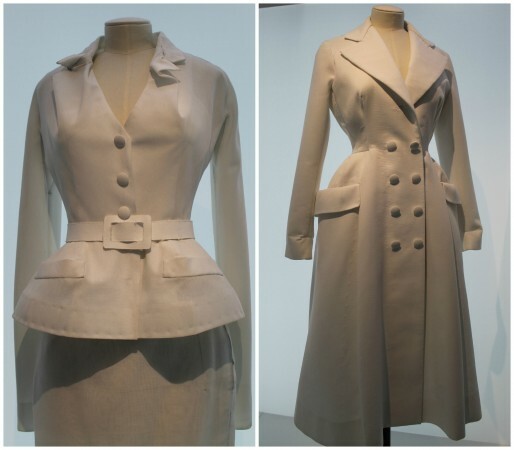 Throughout the exhibition were the well-known motifs of the House of Dior. 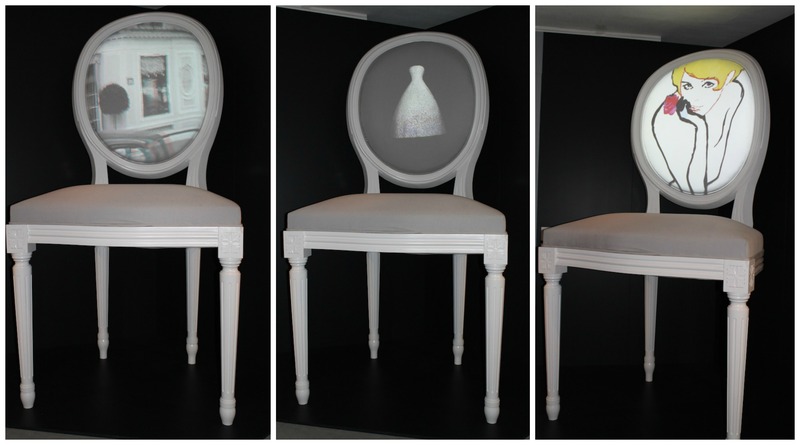 The oval – an emblematic motif found in the Louis XVI chair, the chairs have been in the couture salon since the first show in 1947. 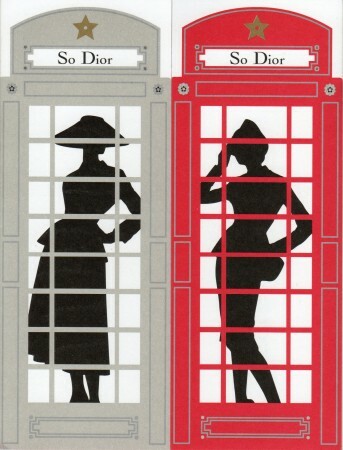 Cleverly they used them to show a wonderful Miss Dior slide show. In earlier years he had been taught to sketch by his friends and when times were hard he sold his sketches door to door, his hat sketches sold particularly well. Later on in his career he would return from his country break with at least 600 sketches for his collections. 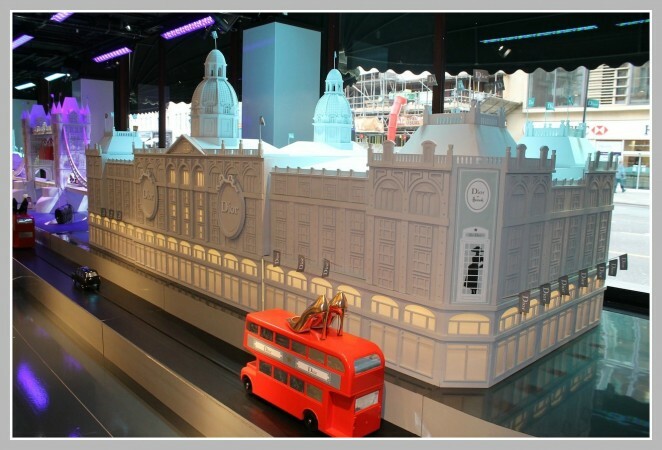 Can you imagine creating that many designs! 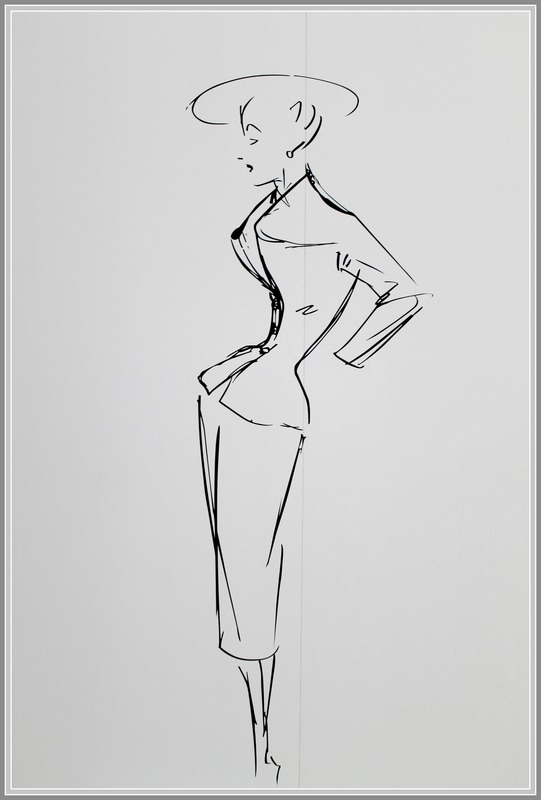 Of course in those days guests to the collections were not allowed to sketch any of the designs, everyone was watched like a hawk in case they copied any of the designs – nothing like today’s live streaming, blogs and instagram. Ginette Spanier, in Paris Fashion writes that he personally evicted a so-called client who was quietly photographing his models during the presentation with a miniature camera hidden in the trimming of her hat. Christian Dior slipped on a pair of white gloves and coolly showed the lady the door. 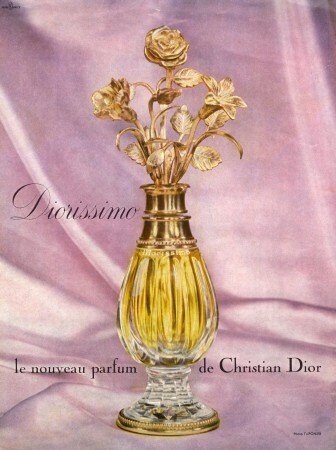 Christian Dior considered perfume to be the finishing touch on a dress. 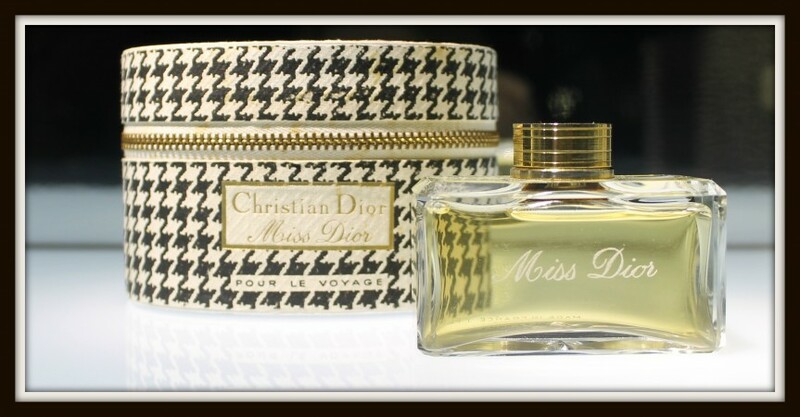 He saw himself as a perfumer as much as a couturier so started a separate company in 1947 for his Christian Dior perfumes. Miss Dior (believed to be named after his sister, who he gave the first bottle) was his first born. The bottle, with a silhouette of the New Look, was absolutely divine and produced by hand, including gold leaf, by Baccarat Crystal. He built a fashion empire and was the first couturier to use licensee agreements. In 1949 the first license was signed for ties, followed in the early 50′s with stockings, lingerie, scarves, hats, knitwear and gloves. Dior had a love of nature and gardening and his lifelong hobby of designing flower gardens stemmed from his mother. Another well-know motif of the House is the Lily of the Valley, Dior’s favourite flower and one of the notes in Miss Dior and Diorissimo. He pinned a sprig on one of the models each season and they also used to go around spritzing perfume on the grey carpet before a presentation. Lily of the Valley became Dior’s keepsake and one of his tokens of good luck. He was very superstitious and used to always consult his fortune teller – Madame D, especially before the start of his shows. Also on the day he created his couture house he found a metal star and from then on he included Dior’s lucky star in many of his designs. 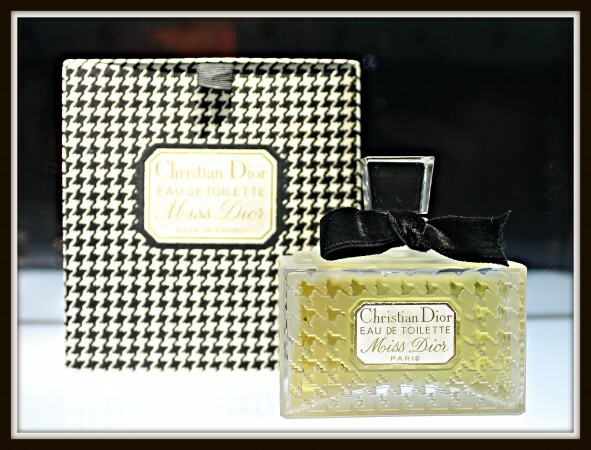 Christian Dior was a perfectionist and took an interest in every detail of a woman’s appearance. 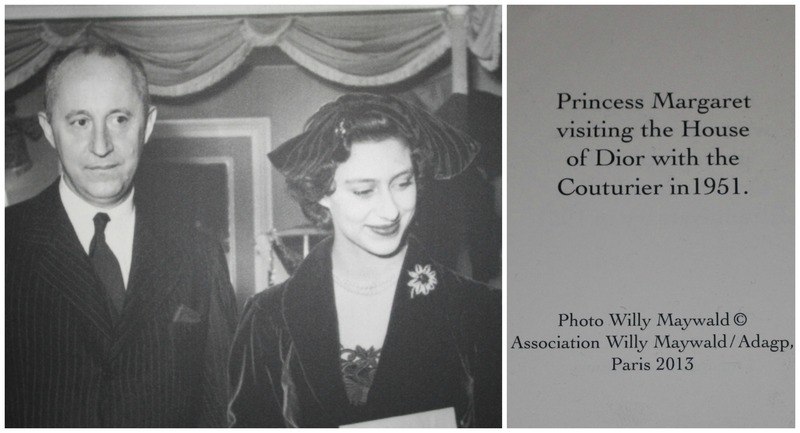 He dressed the world’s most glamorous and famous women: Princess Margaret, Marlene Dietrich (commissioned her screen wardrobe from Dior), Duchess of Windsor, Margot Fonteyn, Eva Peron, Ingrid Bergman, Rita Hayworth and Greta Garbo to name a few. Dior turned fashion into news – every new collection made the front cover of magazines like Bazaar, Vogue, Elle, Match and Time magazine. Miniature mannequins wearing the most divine replicas of some of the House of Dior’s creations all made by the petites mains who staff the Dior ateliers (many of the original dresses having been worn by famous celebrities). This was similar to the Théâtre de la Mode, two thousand doll-like mannequins (about a third of the size of human scale) dressed in wonderful designs from 53 couturiers which was created in 1946 to tour the world to raise funds for war survivors and revive the French fashion industry after the war. The exhibition also featured stunning dresses worn by the label’s famous fans from Elizabeth Taylor, Diana, Princess of Wales, Marion Cotillard, Audrey Hepburn and the dress worn by Charlize Theron from the J’Adore Dior campaign (the bottle represents the femininity of the hourglass silhouette of the early Dior collections). 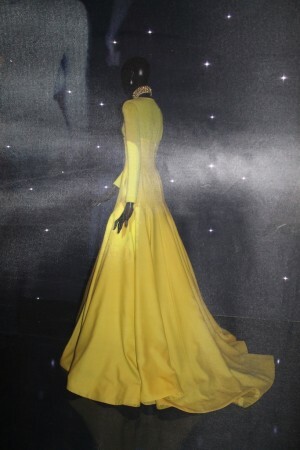 The dresses not only include designs by Christian Dior but also his successors, after he tragically died from a heart attack in 1957 -Yves Saint Laurent (who joined at the age of 19 as Dior’s assistant), Marc Bohan, Gianfranco Ferre, John Galliano and Raf Simons. And there were plenty to see (and buy in the Pop-Up Shop). The Lady Dior Bag (a favourite of Lady Diana and named after the Princess), made entirely by hand from 144 separate parts. The caning effect which is the motif drawn from the wickerwork of the chairs, is sewn into the leather. Once again the process of making the bag was cleverly shown on a large scale model of the bag. Sadly, the Dior Cafe was fully booked and I couldn’t get in (sob!). 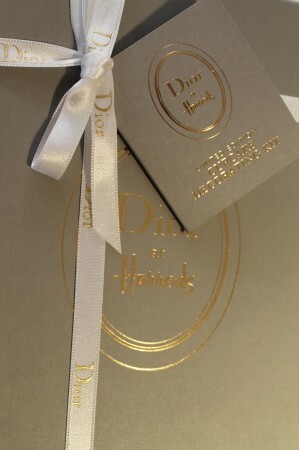 I was desperate to have a Dior cupcake! 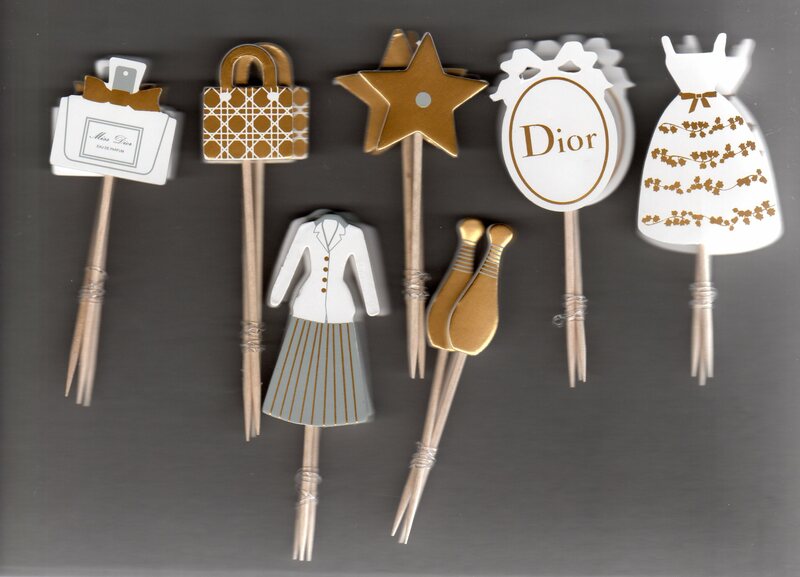 Dior was a passionate gourmet, he loved to cook and invent dishes. A book of Dior’s recipes called La Cuisine Cousu-Main was published in 1972 with illustrations by René Gruau. The first edition, first printing was limited to only 4000 numbered copies. On the menu were some of Dior’s favourite foods: Lobster Club Sandwich, Filet of Dover Sole à la Meunière and Goats Cheese Soufflé. 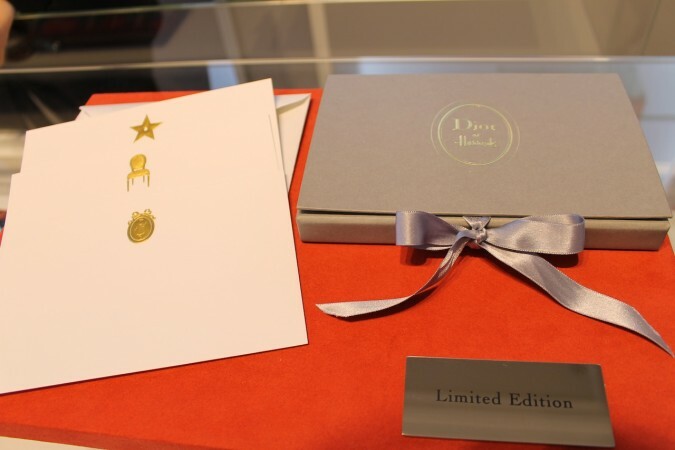 I had also wanted to buy the boxed set of Dior cupcakes, they too had sold out (more sobbing!). However, on another day my dear friend Lottie managed to buy us the last two boxes of the Dior Limited Edition cupcake decorating kit. Amazing! There were also lots of other treats and in-store activity – limited edition beauty products, a choice of one of six nail art designs inspired by the fashion house’s spring/summer 2013 collection, the world preview of the new perfume Gris Montaigne which they sprayed on a beautifully printed little card and which still scents my office. 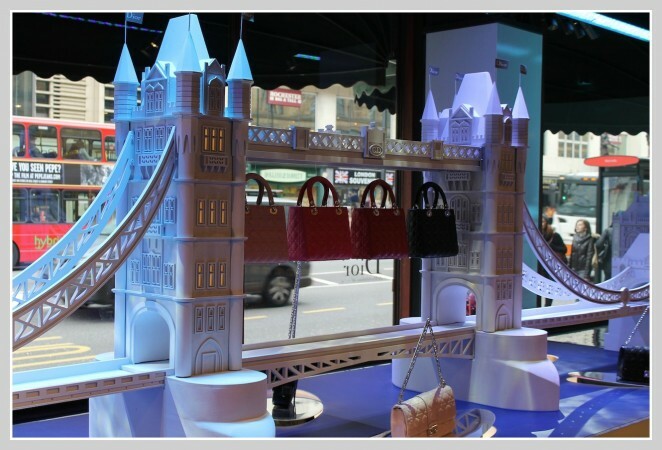 And of course one couldn’t leave without visiting the pop-up store where you could feast your eyes on a number of limited edition items, from the Dior at Harrods snow globe, Lady Dior Bags in either tartan or lambskin to a Harrods|Dior teddy. I say feast your eyes as I could only look, most items were very expensive – the snow globe alone was £300. I believe they took £100,000 just on one day!! But then – cue drum roll – I spotted these under the counter. And my heart missed a beat – for my love of stationery goes back to my childhood and my collection of notebooks, lovely papers, pens, envelopes and stationery is h-u-g-e. This stationery set with 10 cards, each with one of the iconic motifs, printed in gold no less, and beautifully packaged, was so limited edition they only made 25 sets. Well of course one just happen to jump in to my bag and now sits proudly on my office desk – not under any circumstances to be used you understand. Now cue walking to work for the next year in order to pay for them!! A cherished buy. I will leave you with a wonderful image I photographed from the exhibition – a photo by the very talented Patrick Demarchelier from his book Dior Couture by Demarchelier a portfolio of portraits he photographed of over one hundred amazing gowns from the entire era of Christian Dior haute couture. This is a fabulous book – an illustrated history of the French Couture Houses. Each section is written by a group of very talented journalists and writers. It has wonderful black and white and colour photography and stunning illustrations. I was lucky enough to find mine in an old and rare books bookshop but at the time of writing Alibris had at least six copies – nab one quick! One book that is a must for your library. Am impressed with your article. I remember his designs with affection and in fact had several numbers myself (copies of course!) I remember that glorious fashion period well. what a great charming and informative article you have produced for us! missed the exhibition due to happenings and only today found this write up by accident. 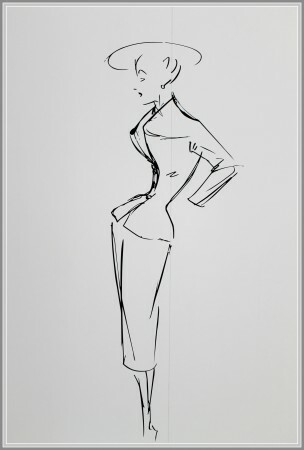 I wish the Christian Dior 1947 Bar Suit sat in my parlor, in the showcase peacefully, so that I could appreciate it and its harmonic beauty everyday……..